I have experience doing this with single file uploads using <input type="file">. However, I am having trouble doing uploading more than one at a time. For example, I'd like to be able to select a series of images, then upload them to the server, all at once. It would be great to use a single file input control, if possible. Does anyone know how to accomplish this? Thanks! And here's what it looks like after clicking the "Upload" button. This is just a sketch of a fully working answer. 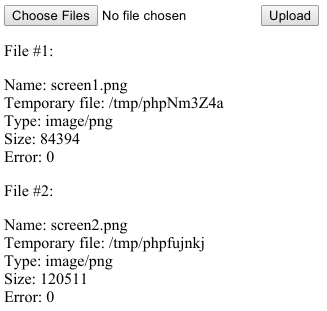 See PHP Manual: Handling file uploads for more information on proper, secure handling of file uploads in PHP. You can use php count() to count the number of files that was selected. Goodluck widdit! If you want to select multiple files from the file selector dialog that displays when you select browse then you are mostly out of luck. You will need to use a Java applet or something similar (I think there is one that use a small flash file, I will update if I find it). Currently a single file input only allows the selection of a single file. If you are talking about using multiple file inputs then there shouldn't be much difference from using one. Post some code and I will try to help further. Update: There is one method to use a single 'browse' button that uses flash. I have never personally used this but I have read a fair amount about it. I think its your best shot. there is one more Flash Based Uploader which is free, Uploadify. i have created a php function which is used to upload multiple images, this function can upload multiple images in specific folder as well it can saves the records into the database in the following code $arrayimage is the array of images which is sent through form note that it will not allow upload to use multiple but you need to create different input field with same name as will you can set dynamic add field of file unput on button click. $table is the name of the table in which you want to store the data..
Not the answer you're looking for? Browse other questions tagged php html http post upload or ask your own question.